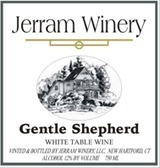 A unique white wine blnd of Aurora (a French hybrid) and other fine grape varieties. Fruity, off-dry and refreshing, serve as an aperitif or with fish, pasta or other casual fare. Serve chilled.